The sports and amusement park is right next to Camp Passail. It includes various sporting facilities in close vicinity to Camp Passail. The challenging 18 hole golf course reaches from Passail all the way to Fladnitz. Every Monday during summer break there are free golf lessons for people who are eager to know what it is like to play golf. In addition there are discounts for visitors and classes for gaining the course-challenge offered. It doesn´t matter which weather is outside. We offer indoor as well as outdoor tennis courts for you! We offer different types of horseback riding classes. There are beginners courses on reliable trained horses, classes in dressage riding, classes in show jumping or trail riding. The participation in these classes depends on the personal standard of education in horseback riding. For curling we have our very own curling hall, home of the female eisstock-world-champion. The curling hall offers seven alleys. Restaurant "Schrenk", which is located at Passail´s main square, is the renting agency for e-bikes. For more detail, go to "e-bike renting". The Lake with its 56m water slide, sun-deck, rafts and its very own beach is an attraction for everyone. Passail is a paradise for friends of hiking. 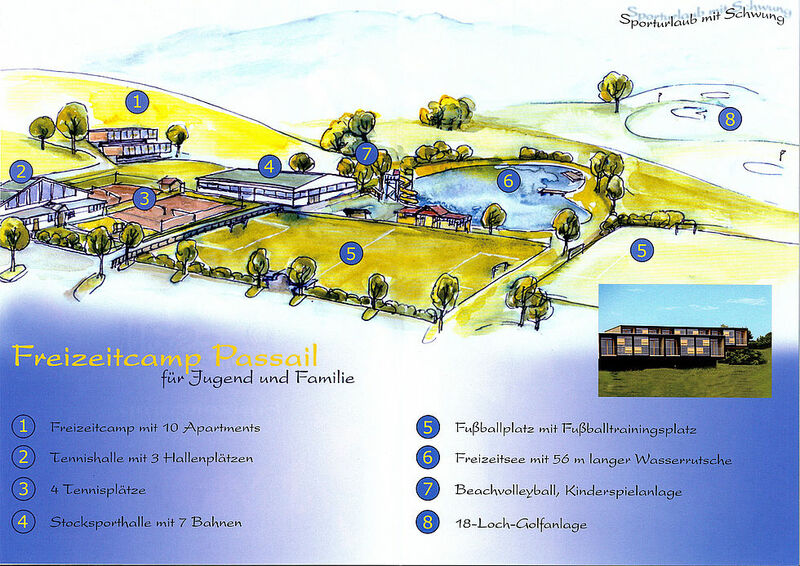 It is located within the beautiful Styrian "Almenland". There are various hiking paths, including a forest, a bee educational trail and an adventure hiking path. Camp Passail offers 2 soccer fields as well as beach volleyball and beach soccer fields. Therefore the camp is ideal for training camps.